If you’re afraid of looking foolish as a Christian, this true story not only will fascinate, delight, and encourage you, it will help you to see God’s hand in your life and bring your own fears into perspective. 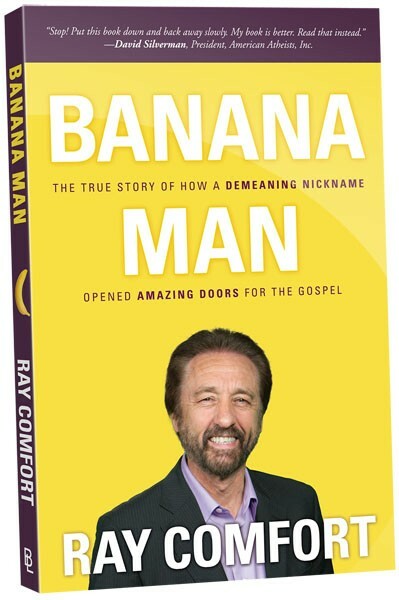 Paperback | 144 pages | Ray Comfort | Take a sneak peek inside. What do you do when the world’s most famous atheist mocks and insults you on international television, in universities, and throughout social media? You look to the Bible and see how Joseph was humiliated before the time came when God opened a big door of opportunity for him, and how Moses was abased before God opened a big sea for him. You take comfort in the Scriptures—in the knowledge that those who trusted God were often the object of “cruel mockings,” and in the principle of humiliation before promotion, of God taking someone low before raising them up for His use. And that’s precisely what happened when Ray Comfort was christened “Banana Man” by Professor Richard Dawkins and then mocked worldwide by the atheist community. It was then that something strange and wonderful began to happen. Millions came under the sound of the everlasting gospel, all because of that humiliating name: Banana Man. So if you’re afraid of looking foolish as a Christian, this true story not only will fascinate, delight, and encourage you, it will help you to see God’s hand in your life and bring your own fears into perspective.